In order to improve the operating reliability of rail vehicles, the sand scattering units inside the rail vehicles are thoroughly tested in the maintenance depots. For this purpose the rail vehicle is moved to a particular track where a brake sand extraction system is installed. This particular track is traversing extraction hoppers that are installed near the spot where the bogie or the corresponding wheel will stop. 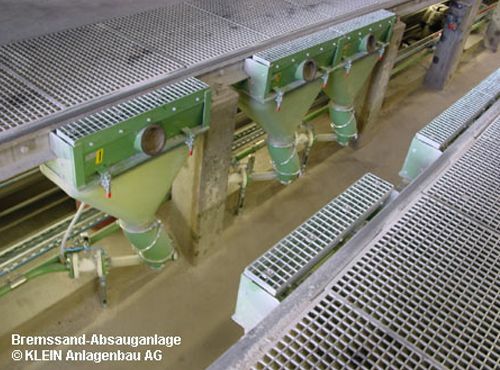 The number of extraction hoppers depends on the number of wheels in front of which brake sand is scattered. The size of the hoppers allows for the rail vehicle to be exactly positioned by +/- 30 - 40 cm. After positioning the rail vehicle, the sand scattering units are switched on and one or several operators visually check whether brake sand is pouring out. 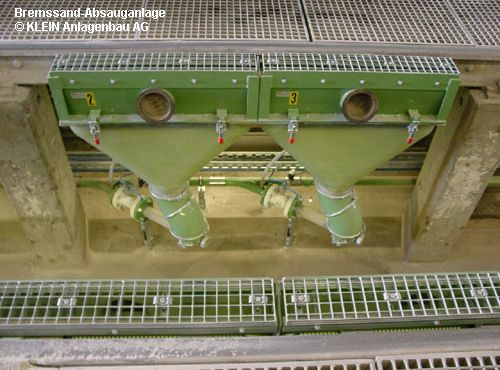 Part of this sand immediately enters the extraction hopper. The main part remains on the track and must later be manually swept into the hoppers. In an extended version, the sand on the track can also be monitored opto-electronically. Another advantage of the extraction system is that the amount of dirt and sand in the working pits is considerably reduced so that oil separators are protected and the risk of slipping is reduced. By means of a shut-off device, the extraction hoppers are connected to a pipe leading towards the extraction unit. This extraction unit evacuates the individual hoppers cycle-wise. Since the extracted sand is contaminated with dirt, it must be disposed and cannot be used again.